Like any workplace, a theatre or other live performance venue, presents hazards to those working and visiting. A two-part guide to Health and Safety and how it relates to working in the theatre,before we go into the detail, this first part looks at some big picture safety concepts. Next time, we’ll look at the specific safety issues in our own backstage world. On Stage Lighting regularly gets asked questions relating to ‘Elf N Safety in a theatre environment: What is the law about this? What are the rules on doing that? Is it true I have to wear a harness when working over 2m from the stage floor, on a Tuesday, if there are less than 2 qualified electricians within 50 metres of the work area? That kind of thing. If it’s unsafe or unhealthy, it’s not acceptable! As On Stage Lighting is read in over 120 countries around the world, we’re going to avoid getting too muddled up in different legislation and instead take a good look of the reality of a maintaining a safe working environment in the theatre. Show business has always had a reasonably good safety record, which is mainly down to the people who work in it, and many areas of the business are really getting to grips with health and safety in the modern world. It’s everyone’s responsibility to do everything they can to mitigate the risks of working on stage, at crew level this means an awareness of hazards and your duty of care to your colleagues. I have a confession. As someone who has spent my entire professional career at work on stage (?!) – I love health and safety. I don’t mean I love clipboards, men with dodgy moustaches and nasal voices going around spouting spurious bits of legislation. I mean, I love being safe at work and knowing that I will be able to come back tomorrow. Being self employed, your biggest workplace fear is injury. Health and Safety – What’s it all about? The H and S phrase has, certainly in the UK, become a bit of dirty word. Often used by Jeremy Clarkson and Daily Mail journalists who don’t have to work for a living, health and safety has become synonymous with killjoys, The fun being taken out of children’s playgrounds and the halcyon days of of our youth, when the long summers were spent dying of asbestosis and other work related diseases. When planning of large construction projects, Human Resources factored alarming death rates into their recruitment policy. The purpose of Health and safety at work legislation is to protect those in the workplace, to defend them against a lack of care on behalf of others such as unscrupulous employers, who would rather get things done quicker or cheaper while putting people in danger. In countries with developed safety legislation, the basic requirement is to be able to demonstrate that you and I did everything we reasonably could to reduce risks. To create a safe working environment in a theatre obviously has to start with an awareness of what dangers present themselves, with generally or specific to a particular show. In order to understand the risks, those in charge need a plan of how the work is to be carried out. In the UK, this usually results in two pieces of paperwork – a Method Statement of the work to be carried out, followed by a Risk Assessment of any possible hazards arising. As well as identifying hazards, the Risk Assessment also goes on to detail how this risks can be managed. Reduced as far as is reasonable practicable, in other words. The other key point about risk assessments and their associated documentation, is that the process does not end with the printing out of a .doc. Risk assessment is a continuing and evolving process over the lifetime of a project. A lot of questions about health and safety are focused on the details of what people perceive it to be – fall arrest harness, hard hats, hi-vis vests. 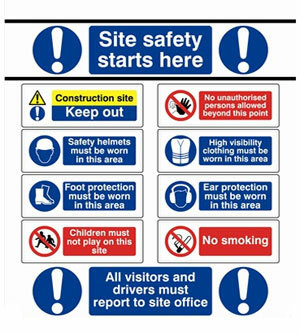 Here’s some news, these are just the finishing touches to a safe working environment. Let’s take a look at some of the really big tools of good safety practice, anywhere. Management and a clear structure is the key to safety planning. At the top level, an understanding of the chain of command and competent handling of the flow of information, as well as proper understanding of the risks. At crew level, clear guidelines of your responsibilities, how and when the work is to be carried out plus and understanding of your place in the hierarchy. Management doesn’t just mean paperwork and calling instructions, it means providing appropriate supervision for everyone. Crew chiefs, senior techs and other experienced team members provide the supervision for more junior staff. A big phrase in H & S is “adequate training”, a right to be provided with the training and for those working around you to be trained sufficiently for everyone’s well being. The level of training varies with each task, a crane operator will obviously need more training than the most junior crew member, but each needs to be sufficiently trained for their task. As part of the Risk Assessment process, many measures to reduce risk include using only operatives holding “X” training certs, licenses etc. It’s a way of being able to demonstrate sufficient training. Of course, there are many experienced staff that may well be much better than their certificated juniors – that is sometimes a judgement call for those ultimately responsible and how their Risk Assessment demonstrates training. It comes down to what you feel you can prove about their levels of competence. A certified plant operator that causes an accident doing something unspecified in the training, they have been negligent. If the operator has no certificate/proof of competence, it could be shown that the management failed to ensure they had adequate training. Anyway, enough about criminal proceedings, we’re here to talk about safety. Probably the biggest weapon in the health and safety armoury is scheduling. It’s a huge tool to mitigate risk, so simple that there’s not a lot to say about it. Scheduling activities on stage so that the risks are reduced to those not directly involved, keeping physical separation between two tasks and not having everyone working on top of each other. This can be laid out in the main production schedule but it also comes down the different departments what share the same space, choosing not to work at height with loose hardware while those underneath build the set, for instance. The growth of show business, particularly the backstage and technical disciplines, in the last 30 years has led to ever greater professionalism in the industry. In the 70’s, rock concerts were being staged and staffed by mavericks in a toddler industry just finding it’s feet. Today, we have job descriptions, centres of education and professional bodies all geared toward working in a theatre or show as a profession. All this has led to better training, more skilled staff and a greater awareness of health and safety issues. Several friends of mine are now specifically engaged to manage safety on large sites, as ex-technicians they are the best people to genuinely understand the risks. It would interesting to know if this will have an impact on actual statistics of safety in our business, one that already has an enviable record. But there are places that still lag behind on the awareness of even the basics of legislation. In my experience, the best parts of the concert and events business lead the way in the application of modern safe working practice on stage, while some theatres continue on with a less formalised approach which seems to work for them (whether they are complying with all their legal obligations, I wouldn’t care to say). Next time in this two part series, we’re going to look at some specifics of safe working in a theatre environment, particular hazards and how they can be avoided. Hopefully this has given you something to think about in the meantime. Is it true I have to wear a harness when working over 2m from the stage floor, on a Tuesday, if there are less than 2 qualified electricians within 50 metres of the work area? That ridiculous remark, establishes how ridiculous your comments are. Certainly not professional. While it’s true that such questions about the “rules” of safe working aren’t usually asked by professionals, not everyone working in the business understands that health and safety isn’t a magic list of prescribed rules which, if followed, ensure a long life for everyone. But I’ve heard some pretty outlandish nonsense talked about “the law” and the example in the article, while tongue in cheek, isn’t far off the mark. It’s important that those of us responsible for the workplace safety system understand that. Really enjoyed the article about Health & Safety in the Theatre but I can’t find part 2. Is it still available? Part 2 is still on the drawing board, it’ll surface in the future. Glad you enjoyed it. Why do stage lights have a safety chain. If the light is fixed using a well pre-designed bracket which is fit for purpose what use is a chain. We don’t fit chains to any other light fittings why do we fit them on stage lighting?? I have had a similar question in mind… but mine was, why do we add a safety chain to a moving light, when we are already attaching the light to the truss with TWO clamps, each clamp very easily able to hold the full weight of the fixture alone (sometimes the clamps are rated at 500kg, and we use two of them!). Surely this can be considered safetied already because it is being held by two independent attachements? The safety chain would be a third attachment? If it is required, then where do we stop? why not 5 safeties? But I did ask a H&S structural engineer about it on a job where he was signing off our rig. The answer he gave me was that it is possible for human error to incorrectly attach the clamps to the light, and since both clamps attach to the light in the same way, if there is an error on one, then it is highly likely that they are both incorrectly attached to the light. So the safety chain represents a totally different way to attach the light to the structure.